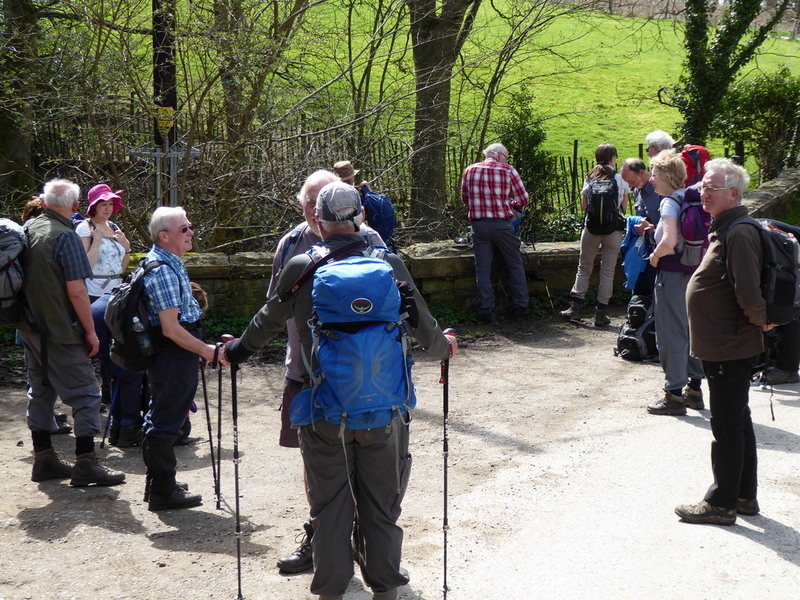 There was some confusion at the start because some people, who should have known better, had failed to tell Bill that they would walk to the start at Wheelock rather than the car park at Waitrose. Always let Bill know if you plan to start the walk in a different way or not come at all. 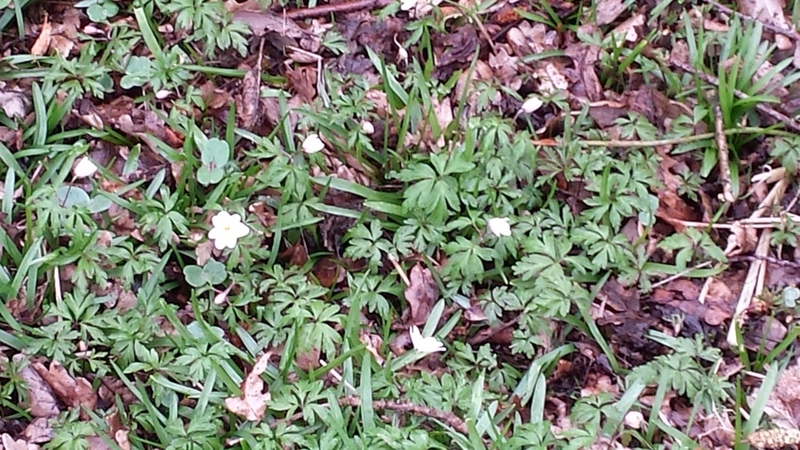 Our leader planned the walk so that we could all see the wonderful display of wood anemone flowers in the woods by Crewe Golf Course. 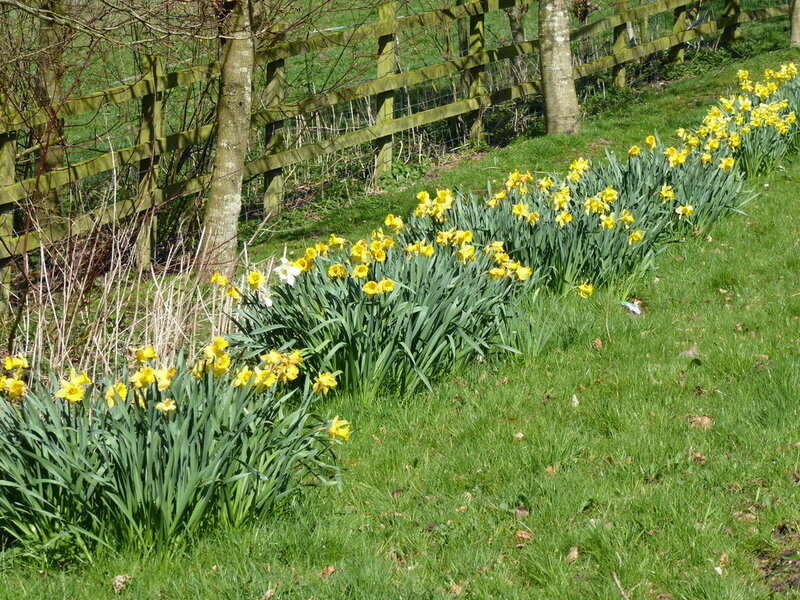 He apologised in advance because the cold blasts from Eurasia had held back the emergence of the flowers. 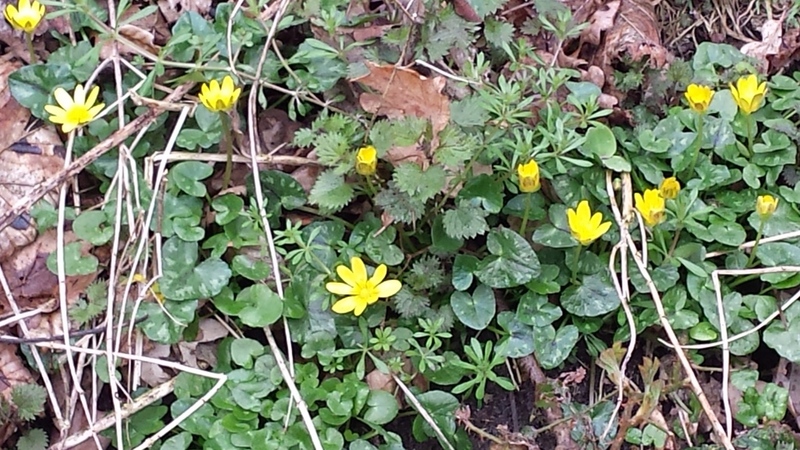 Some wood anemones had flowered when we passed through the woods but our leader didn’t make it clear how much of a display there should have been without the brutal Russian intervention (of cold air). 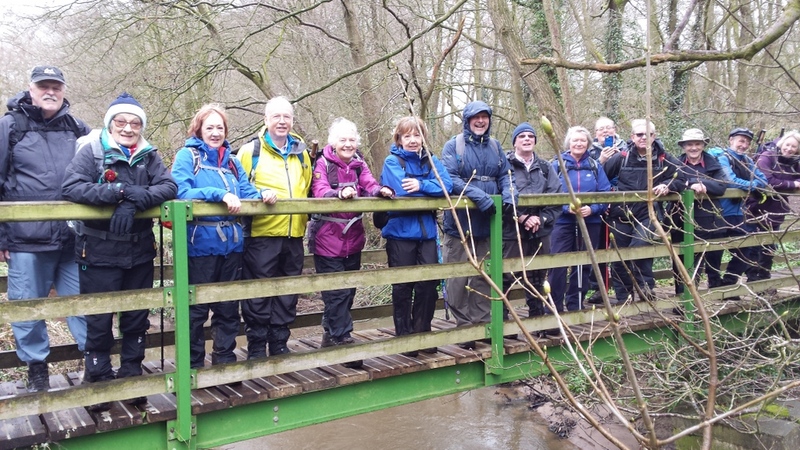 As we skirted Winterley, we had to point out to Betty how helpful it would have been for Nigel to pop down to meet us with a tea urn and some cakes as we crossed Hassall Road. Maybe next time. 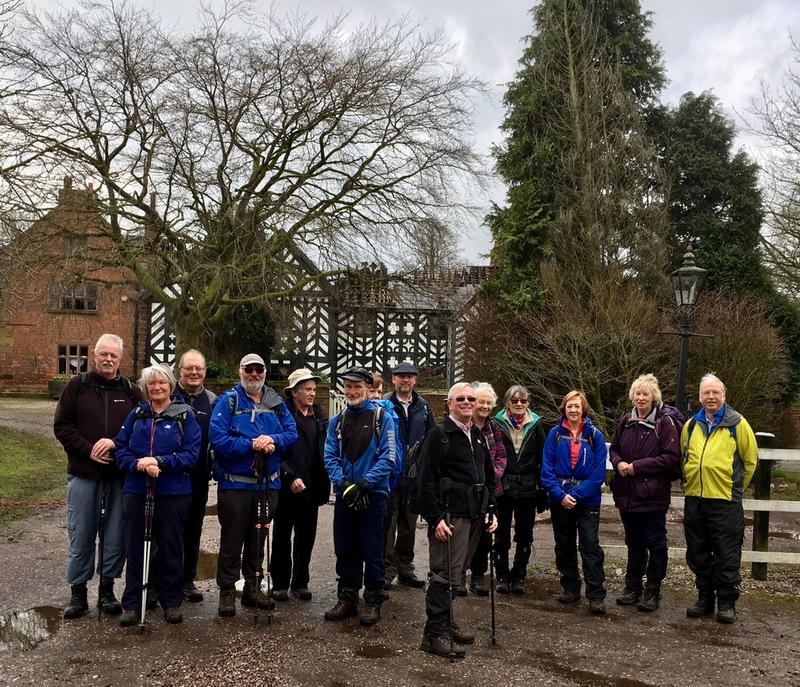 We were looking forward with excitement to passing Haslington Hall so soon after it had gone up in flames and we stopped in front of it for a new type of group picture when no bridge is available. 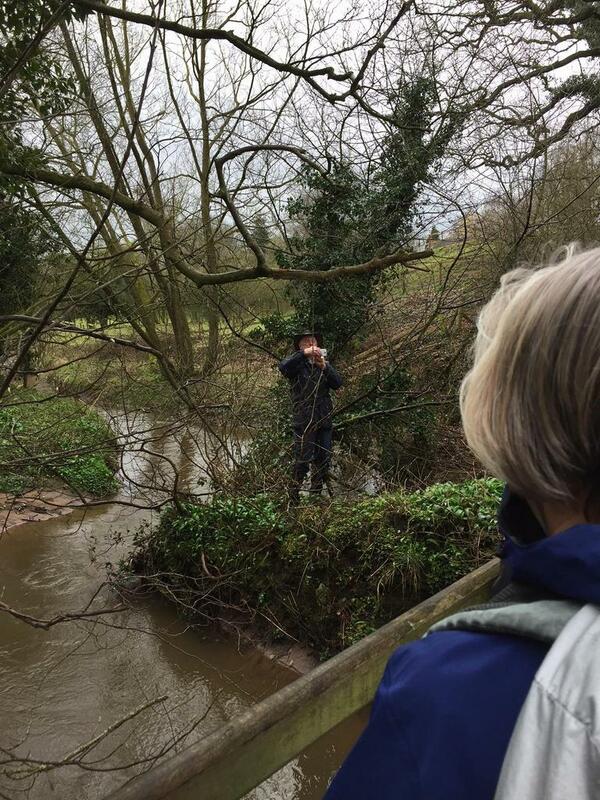 If recce leaders can sniff out scenes of crime, accidents or natural disasters on route, we could collect a series of misery memories just like the Daily Mail. 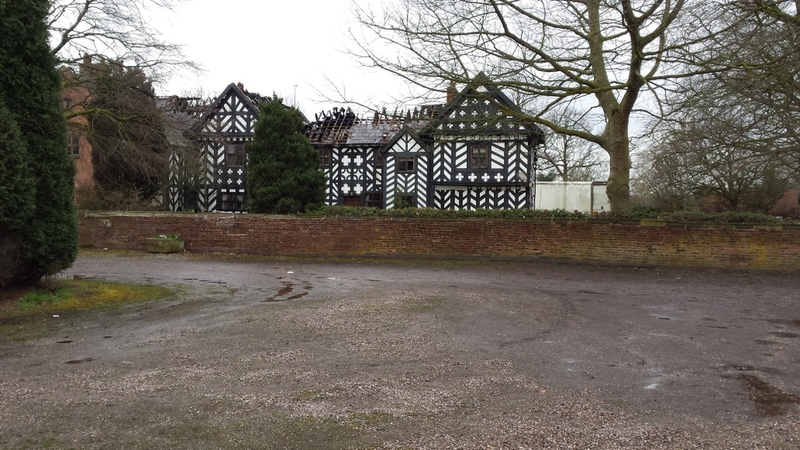 Haslington Hall is an excellent choice for a misery memory; it has just suffered major damage in a fire. Before that it was a failed venue for weddings, the wreckage of which is still strewn about. 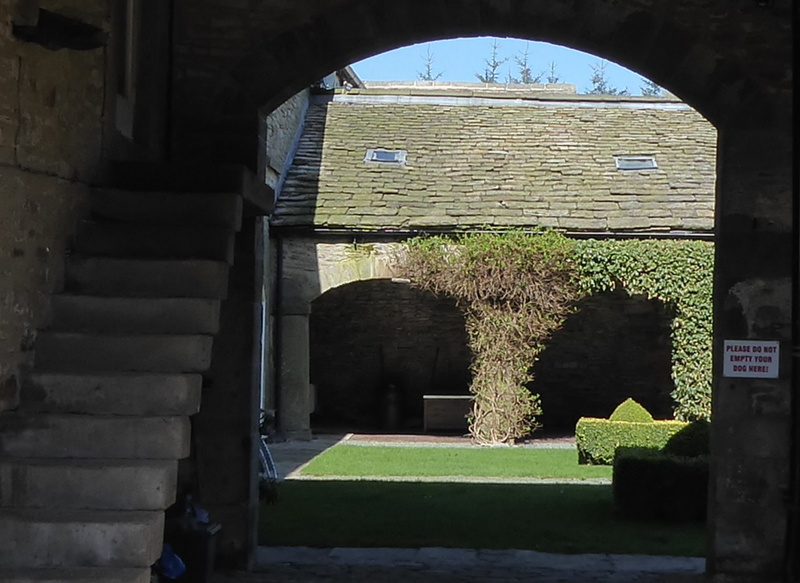 The house was built in 1545 by Admiral Sir Francis Vernon who later had the task of dismantling ships from the Spanish Armada and it is rumoured that these ships’ timbers were used to build later extensions to the hall. There is no documentary evidence for this; the details of its early years were recorded in documents kept in a Manchester bank but the bank was destroyed in the 1940 bombing of that city. How much misery to be associated with one building! Crewe Golf Club has its course in Haslington so we popped over there next. 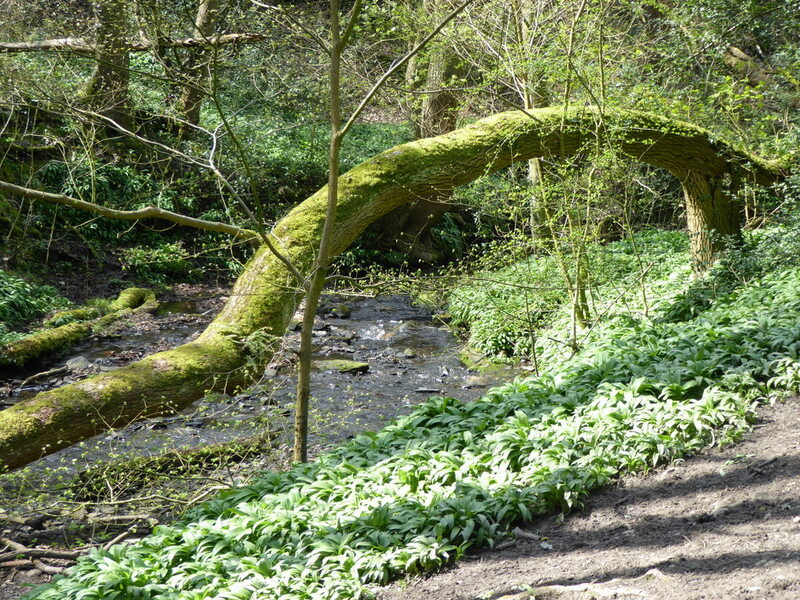 The path through the wood followed a meandering stream which we crossed several times. 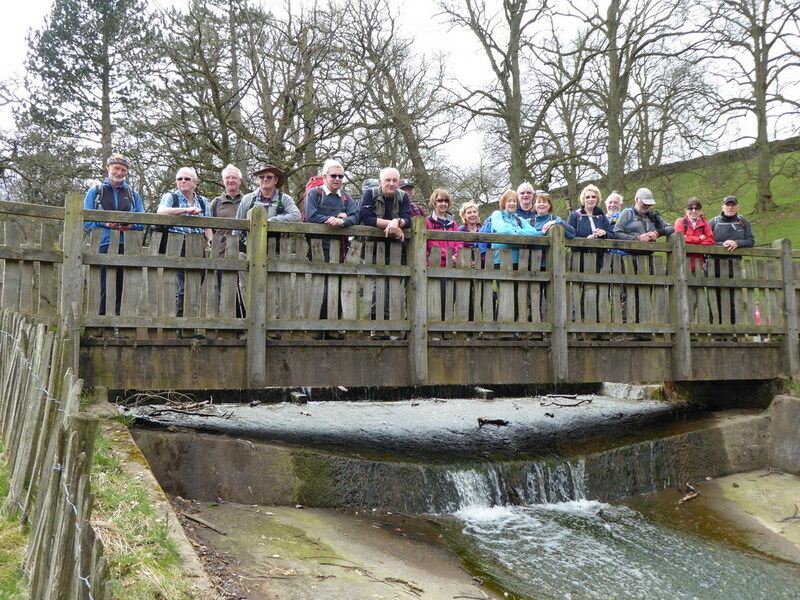 At the first bridge there was no attempt to take a group picture; Ralph was away again and Ian demonstrated his dismay at the lack of respect for a hallowed tradition. 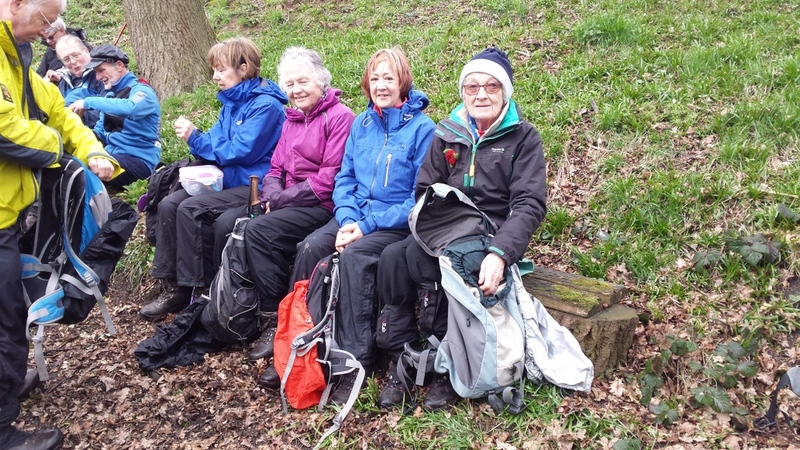 The last time the group came this way two years ago, some of the ladies collapsed a rustic seat but it has been repaired and now has substantial logs as supports. It survived this visit in its more robust form but only four ladies dared to use it. 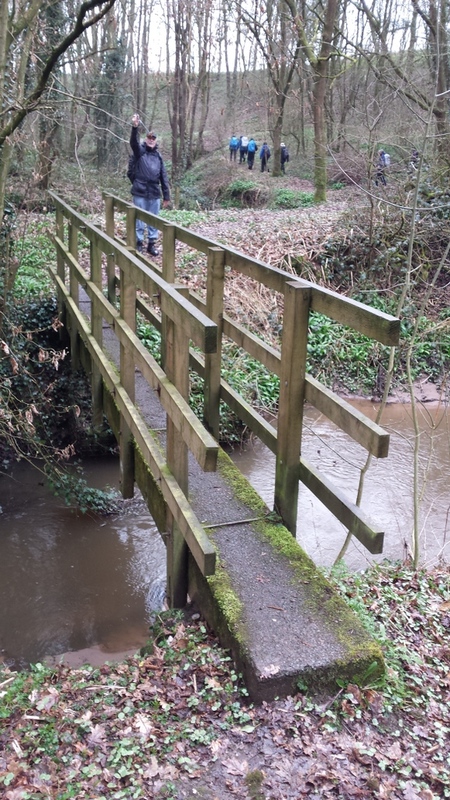 Before we left the brook the stand-in photographer managed to capture a bridge picture but was lucky not to fall in the brook from his perilous perch. 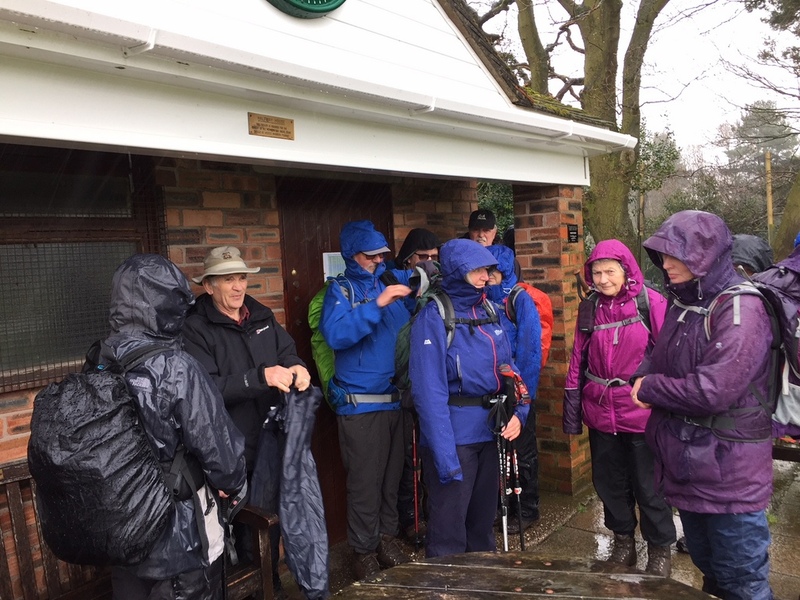 Back on the open course we endured a particularly heavy shower as we stopped at the Halfway House for a toilet stop but we eventually had to move through the rain to our lunch stop in Oakhanger Moss. 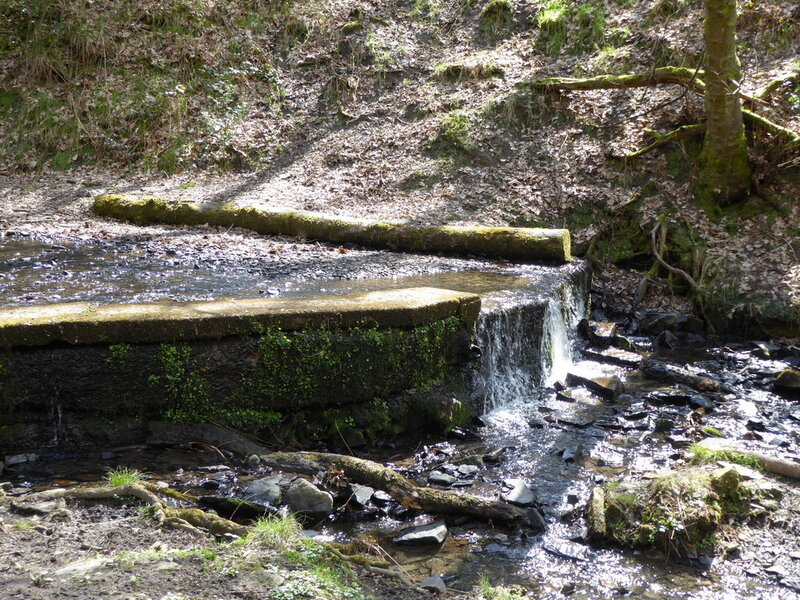 The site consisted of four low brick walls which Ian described as the remains of a filter bed. He used to investigate unpleasant substances for the council so he should know. While we were crammed together on the filter bed walls we were treated to informative talks on the formation of meres (geography) and salt beds (geology). 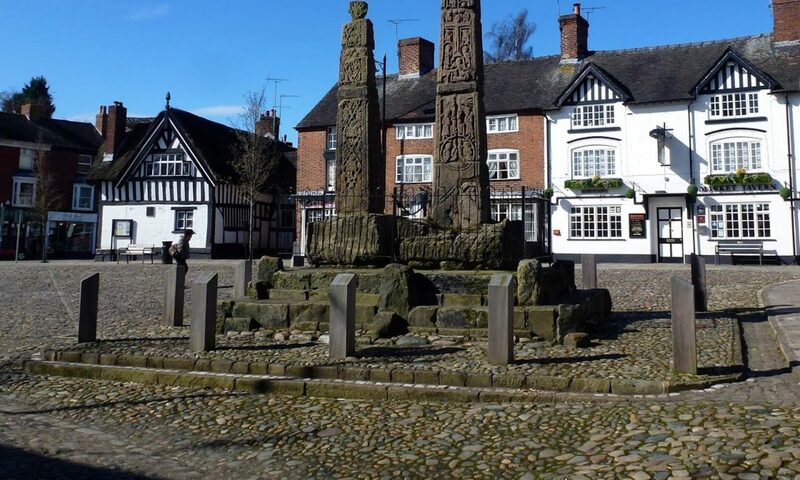 Stephen says geology is all about rocks deep down but he is not ignorant of geography; he has an ordinance survey map centred on Sandbach but when Elaine asked him where we were he could only answer “Near the M6”. Elaine used to be in a caring profession and demonstrated this side of her nature when she made sure Betty didn’t leave her gloves in the filter bed. Unfortunately this took so much of her attention that she left her pole behind. The South Cheshire Way took us through the garden of a house which had three dogs; two of them barked continuously while we passed but the third scrabbled to get in the house. Whether it was seeking reinforcements or fleeing in panic wasn’t clear, but we all escaped unscathed. So much rain had fallen during the walk and beforehand that there was mud and standing water all over the fields we crossed. 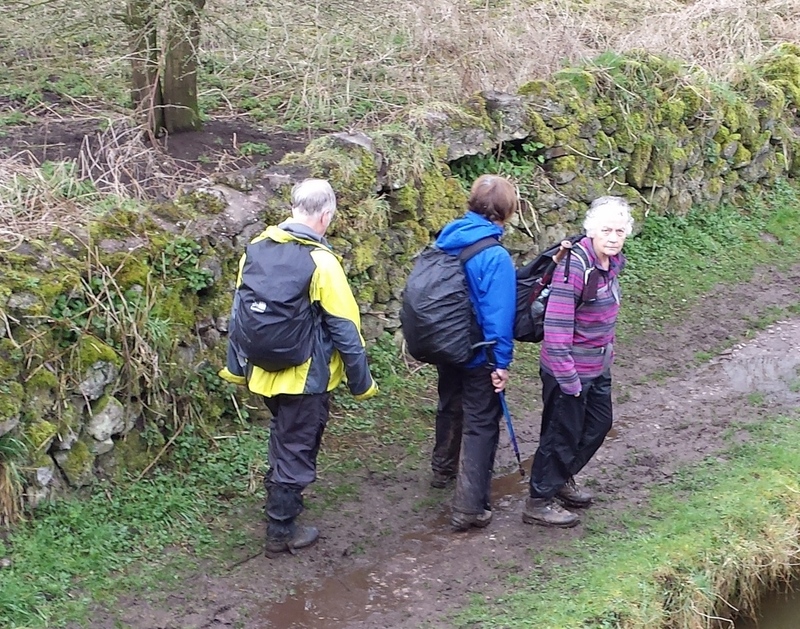 As we crossed Malkins Bank Golf Course it was obvious that Elaine had acquired a large amount of the available mud on her overtrousers and in spite of rubbing them together to make a rustling noise, they were still covered. Paul Hebden would have been impressed how well she had spread the mud. We assembled for the walk in the car park of the Shrigley Hall Hotel and Spa while hotel staff were disposing of old beds in a skip. The extent of the stains on some of the mattresses was instructive. It doesn’t do to inquire too closely about what hotel sheets are covering. Soon after leaving the car park we met a gate that had been previously open but was now fastened shut. Rather than set Graham his usual task of removing the fastenings from the gate, John said we should retreat out of the field. Now, Graham likes to find a short cut, so he spotted a low point of the wire fence and strode over it. He nearly made it but his toe caught on the wire and he landed in a nettle patch. He’s tough. As the group reassembled, Ernie joined us after arriving late. 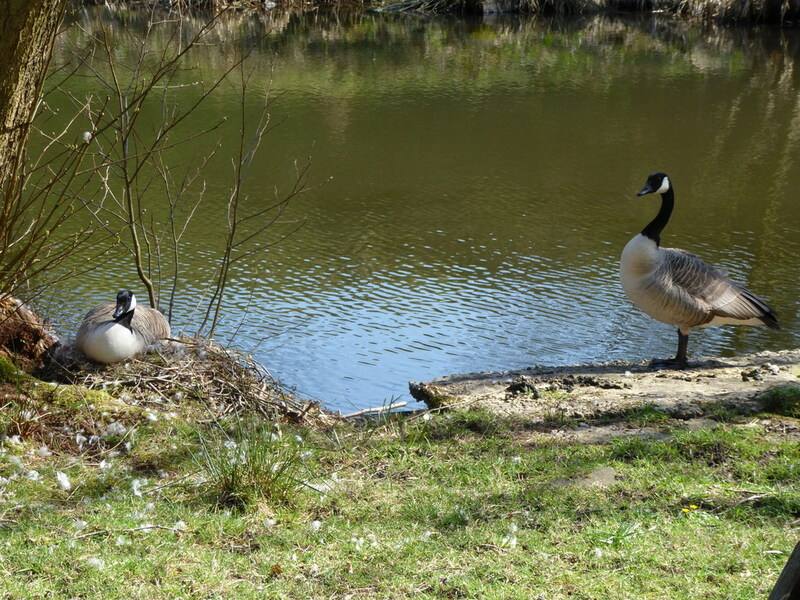 A few fields further on we passed a goose taking a break from sitting on a clutch of three eggs. 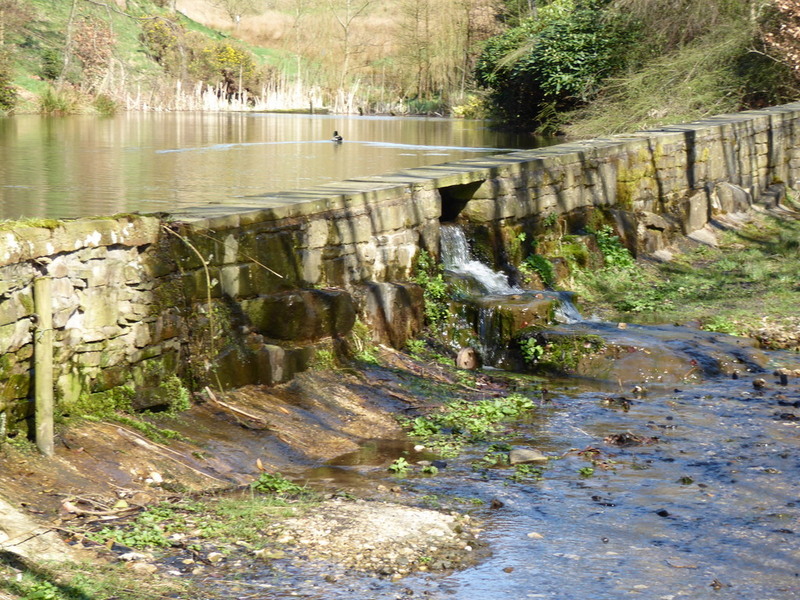 The nest was beside a pond near Birchencliff which was fed from another pond overflowing the track we walked along. 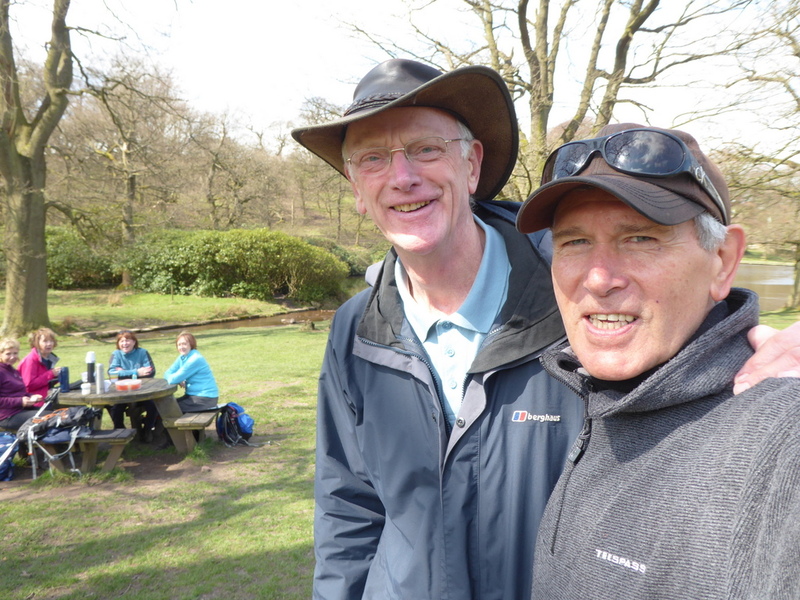 After this gentle introduction we climbed up Park Moor to Sponds Hill where we stopped for a welcome drink and viewed Cheshire and Manchester spread out below. Our next destination was the mysterious Bowstones above Lyme Park. 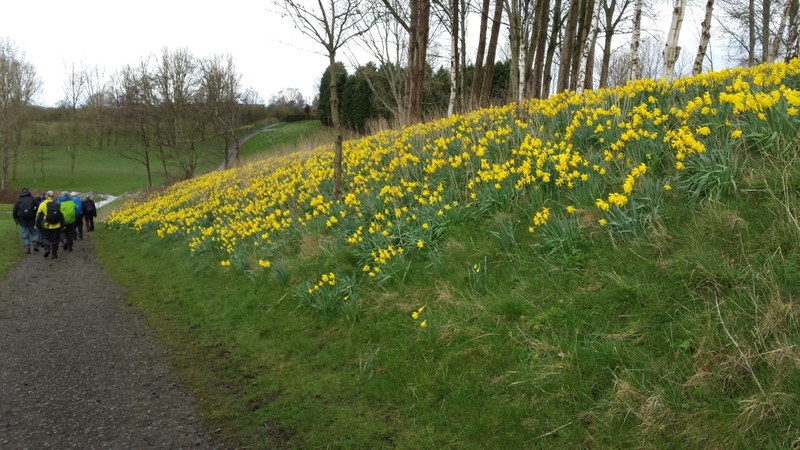 The fact that nobody knows what they are hasn’t stopped them being a scheduled monument. 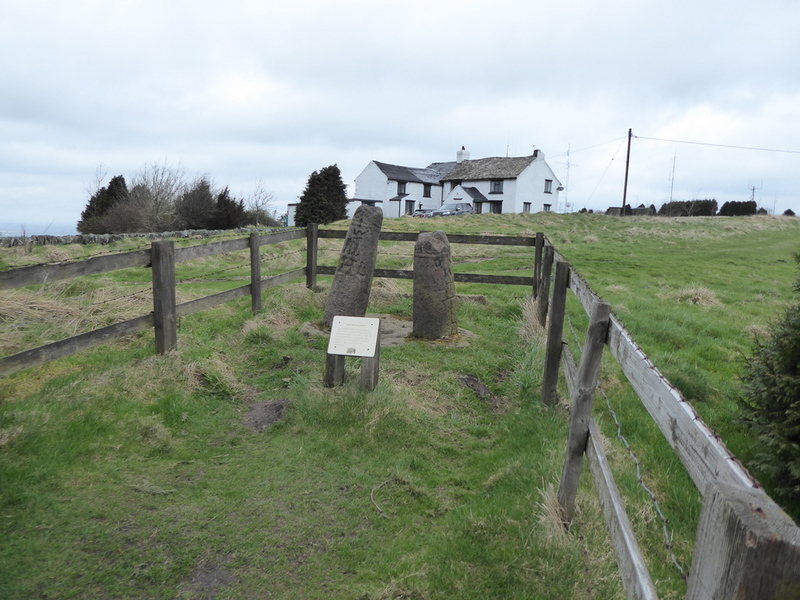 The internet hints at 10th century Saxon, Bronze Age or Robin Hood but they are just two carved stone shafts by Bowstonegate Farm. 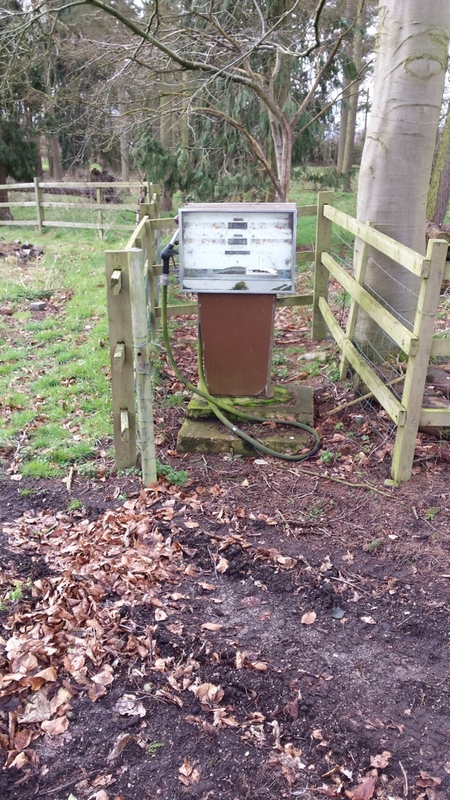 The farm is just as mysterious; why does it have so many radio aerials and a locked door to an underground bunker? Where is Fox Mulder when you need an answer? 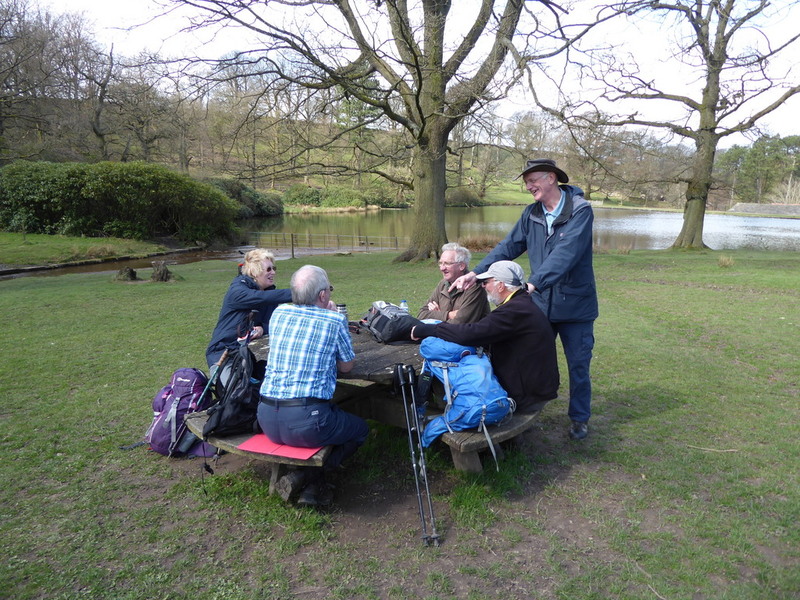 The welcome downhill path took us into Lyme Park, where we headed for the picnic tables by the Timber Yard. 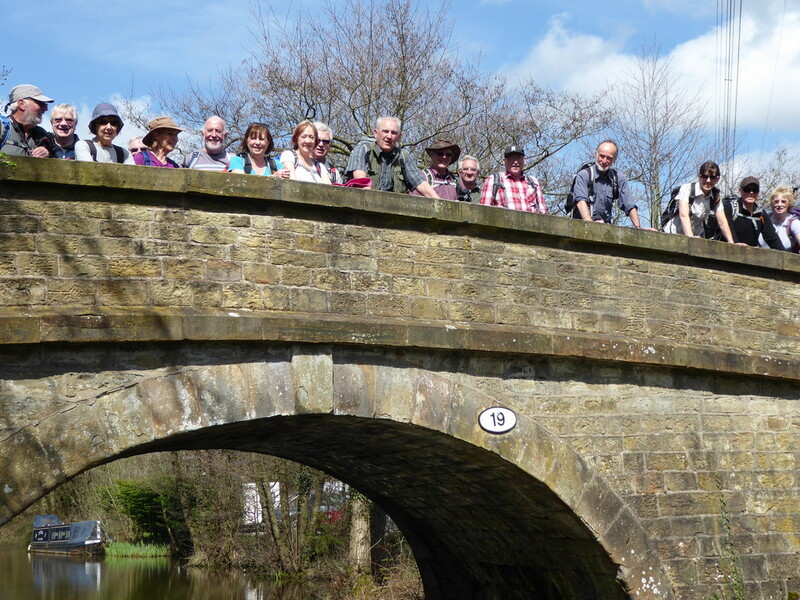 John showed off his selfie technique and after lunch in the sun we assembled for a bridge picture before setting off for another hill with views over Cheshire and Manchester. This time we found another sight to gaze at and photograph; a small herd of deer was hiding behind a ridge until we flushed them out and sent them on their way. The next stage took us through woodland until we emerged onto the road that led us to the Macclesfield Canal near Wood Lanes. To reach the towpath we had to impose traffic control on the tunnel under the canal and climb the embankment for a mile of flat walking until the turnoff for the café. 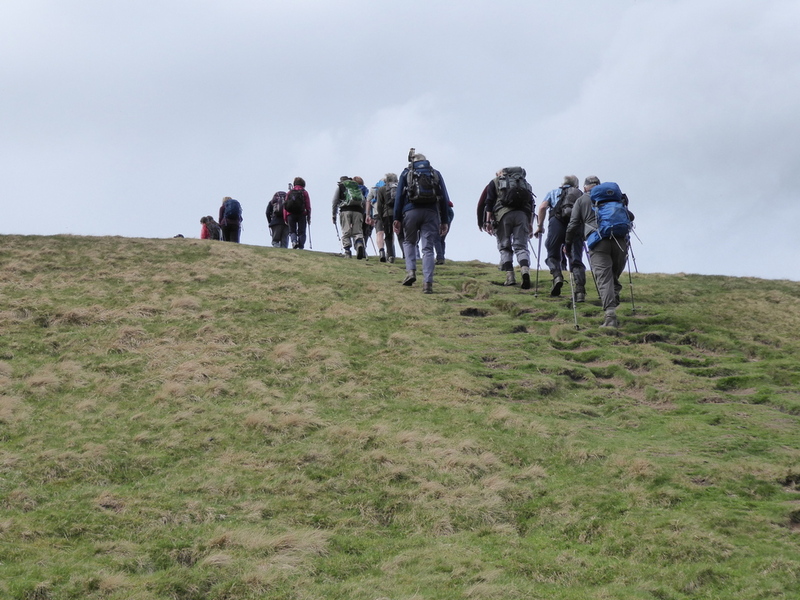 The café was such a strong draw that several walkers shot ahead of the leader. This prompted him to make an unconvincing detour in the wrong direction to bring them to heel. This didn’t last long before we continued to the café, where we had high expectations of freshly made cake and drinks. Sadly the café had closed that day to reopen in May. What a gastronomic let-down! 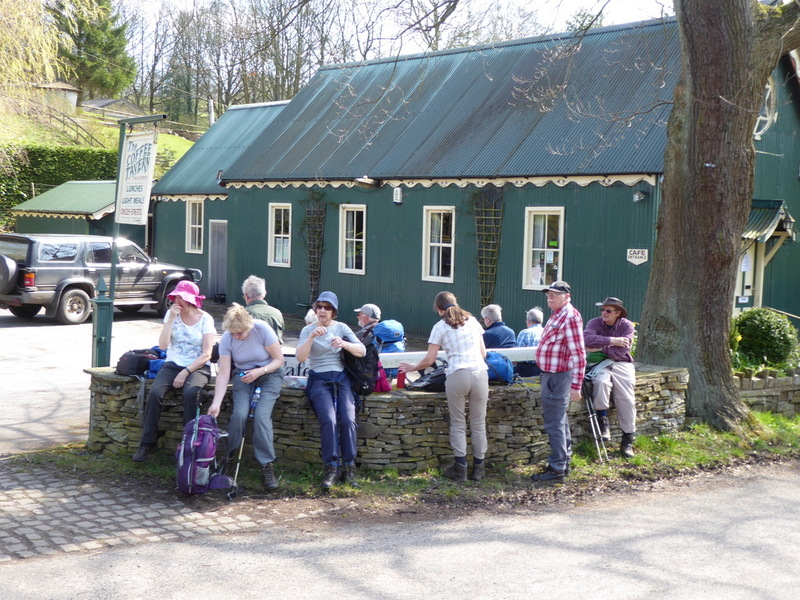 It was a thoroughly deflated and disappointed group that made its way back to Shrigley Hall via Birchencliff in the hot sun. Lunch is over. 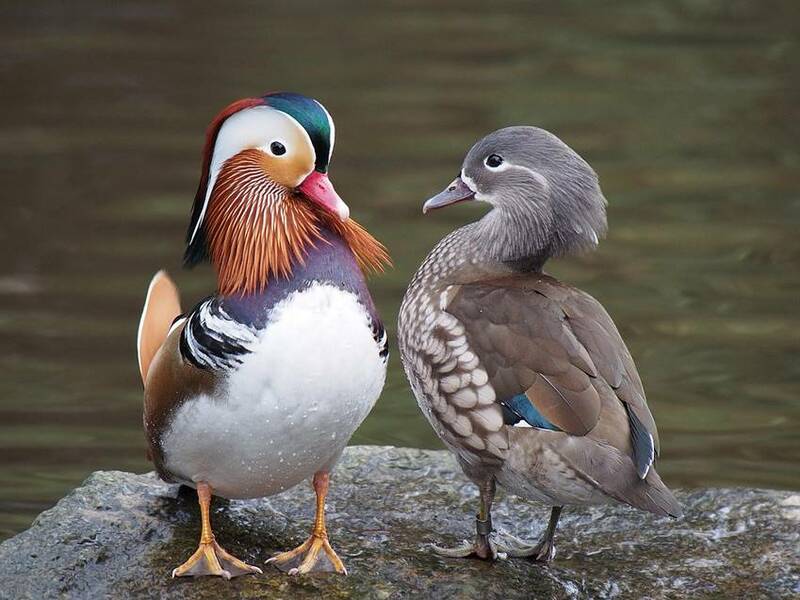 Let’s pose. 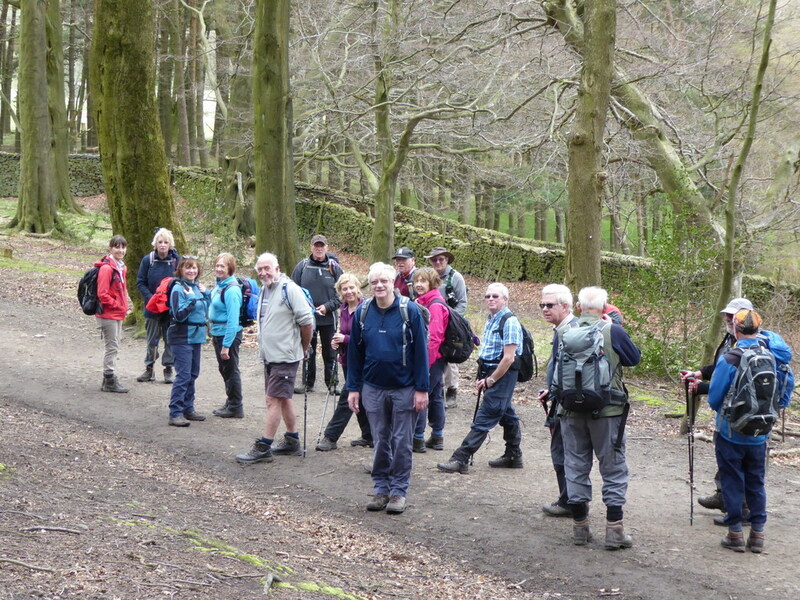 The walk started at the Longshaw Estate car park to avoid railway car park charges. Anyone using the scanner to read their National Trust card had to battle with confusing instructions completely unsuitable for old people. 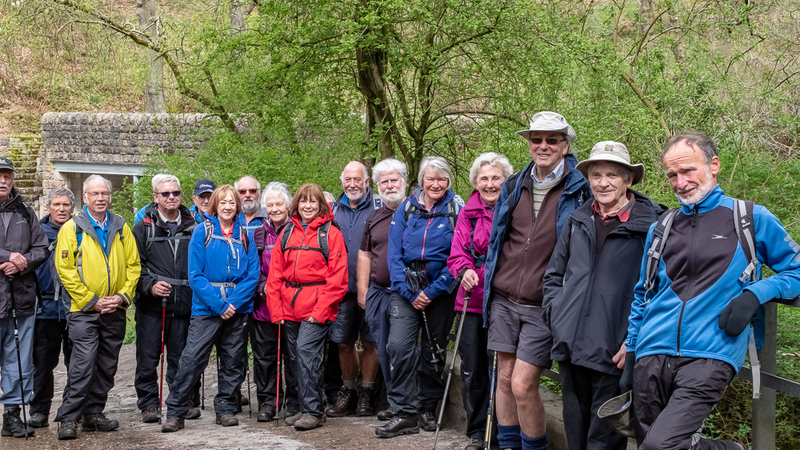 The cold forced walkers to don their extra layers for protection before setting off to Padley Gorge to catch the train from Grindleford station. 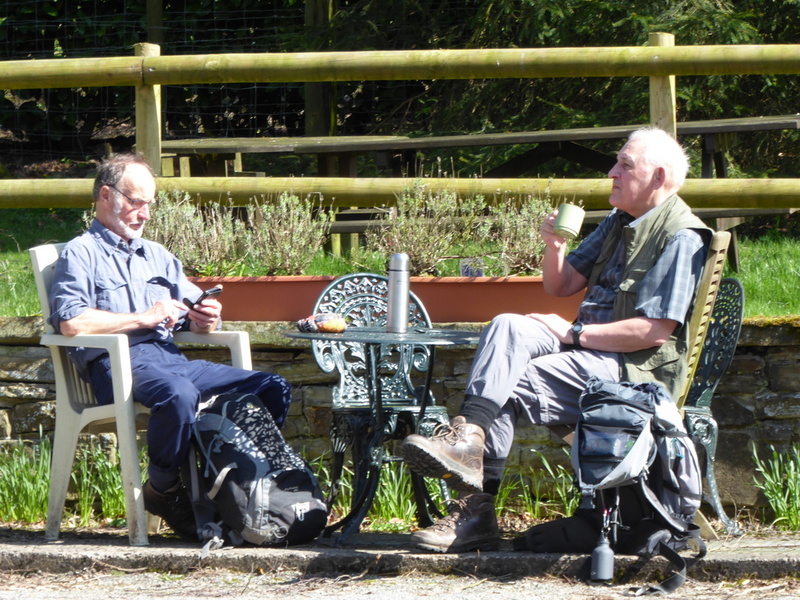 We arrived in plenty of time for the train to Dore and Totley Station, so a coffee stop was declared. Sadly this prompted the rain to start and forced everyone to squeeze into the station shelter. 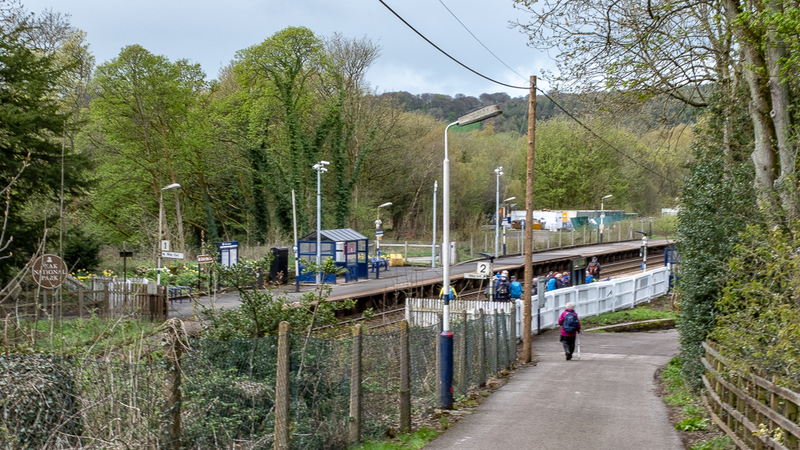 The arrival of the train at 11:50 put an end to this misery and the ticket collector may have decided to compensate us by giving a free ride through the Totley tunnel. Or possibly, he couldn’t be bothered! 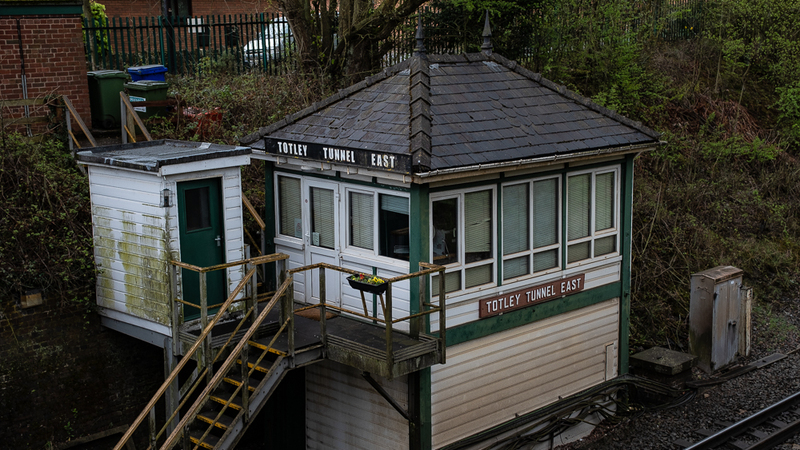 The Totley Tunnel, opened in 1893, is now the longest wholly underland railway tunnel in the UK at 3.54 miles. The suffering of our group echoed the problems faced by the workers who built it; at one stage the digging broke into a spring that flooded the workings with 5,000 gallons of water an hour. The workers also suffered outbreaks of typhoid, diphtheria, smallpox and scarlet fever, not helped by the fact that accommodation was scarce, and they were living often twenty to thirty in a house. At least we didn’t have to climb into a bed that somebody had just vacated – not on the walk anyway. The walk began in earnest from Dore through one of the posher bits of Sheffield, but the rain was belting down again so it was difficult to appreciate this. The replacement back markers did their duty by frequently asking what time was lunch! 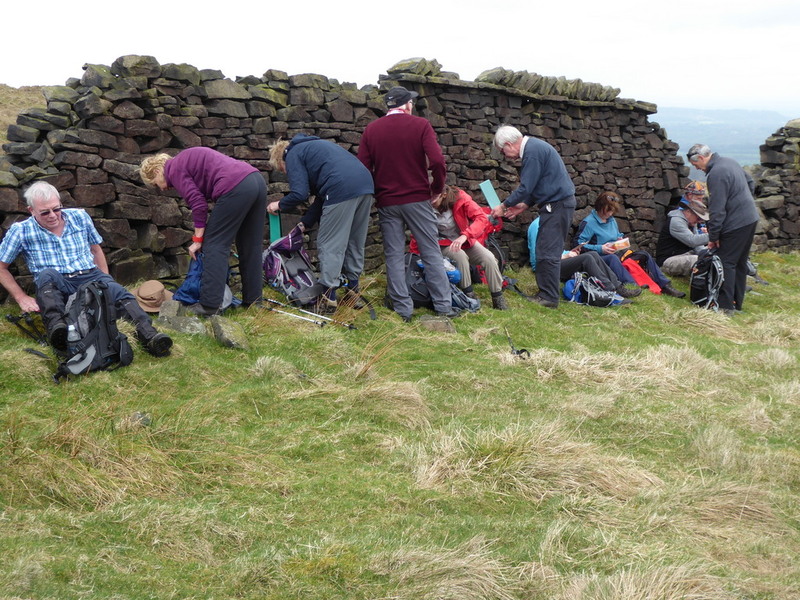 Eventually the rain stopped and we were ready for lunch at the Cricket Inn. We had permission to use the outside tables, if we purchased drinks, so we took our wet and dirty boots inside to plague the barmaid, who should have chosen to work in a pub where she could reach the pint pots without a ladder. With things going so well, a torrential shower had to follow and it was accompanied by hailstones! 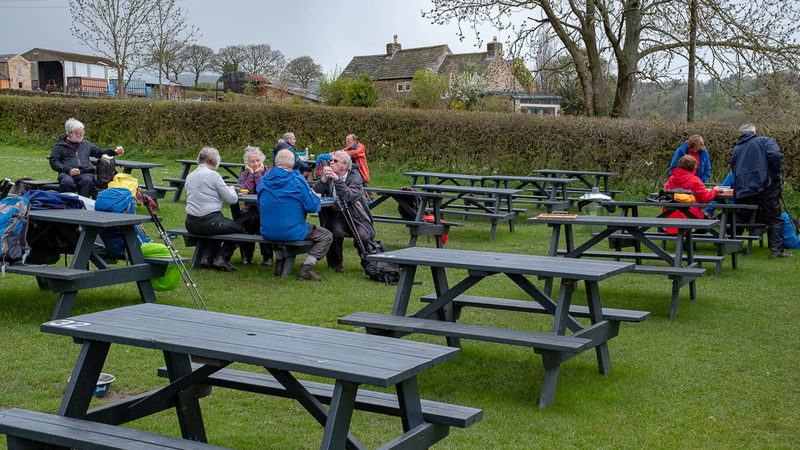 Most walkers rushed back in the pub, but some brave souls defied the elements and complained of watery tea, coffee and beer. 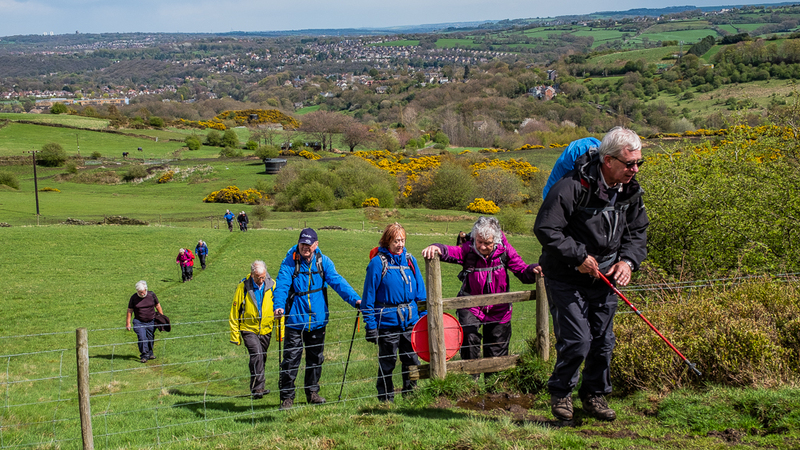 The return journey started in bright sunshine with the climb onto Totley Moor – a walk offering superb views over Sheffield, Holmesfield, and Ralph’s home town of Dronfield. On a good day you can see practically the whole of Eastern England (within certain latitudes). This wasn’t a good day, but Dave hadn’t brought his binoculars, so nothing could be identified. 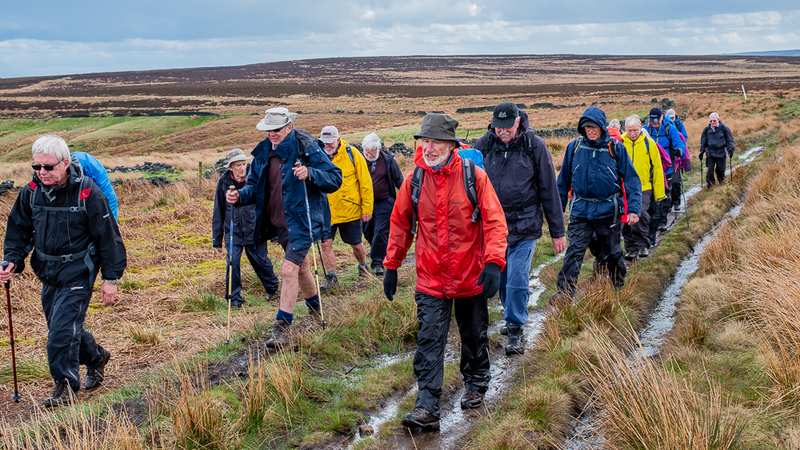 The next stage, on the top of the Moor, brought out the worst out of the weather. At a conservative estimate, 50mph winds slammed us with hailstones that penetrated clothing and minds alike. This took our minds off the climb and the bog so that’s all right then! Those wearing shorts had extra problems in the conditions. 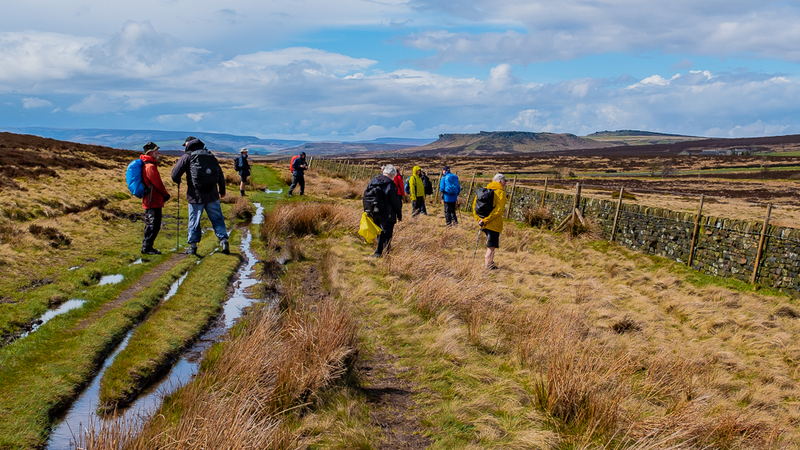 We completed the last part in sunshine with great views across the Western Peak District – all conscious of the next batch of hail and sleet heading rapidly towards us. It didn’t make it and left 18 people looking forward to hot baths, showers, toddies, cups of tea etc as they navigated the flooded roads home.